In our previous blog, we focused on Spring Cleansing of the Mind, Body, and Home. Today, we’re expanding on the cleansing and detoxification of the body with some delicious smoothies! As the weather gets warmer and we enjoy more outdoor activities, it’s essential to replenish and fortify our bodies with nutrients and minerals. Including antioxidant, anti-inflammatory, and immune-boosting ingredients in smoothies is a great way to drink in the goodness. We often use organic frozen berries so the smoothies blend into slushy, frothy yumminess. And, frozen berries keep longer so stock up on some when you get a chance. Additional wonderful and tasty ingredients to include in smoothies are watercress, lemongrass, turmeric, and matcha. Make several servings at a time and store some in the refrigerator to enjoy over the next few days. Or, freeze the extra for a frozen treat during those warms days or whenever you’d like! What’s your favorite smoothie blend? Let us know. Happy blending! It’s almost Valentine’s Day and we have a treat for you!!! Now through February 14th, receive a complimentary Foaming Facial Cleanser (a $25 value) with online orders of $75 or more *! Shop online at www.NaturallySusans.com. Happy Pampering 😊! Winterize your skin with our Avocado Rose Salve! …Sarah B.! Sarah won The New Yorker Package that includes some of our multitasking essentials. Congratulations Sarah and thank you for subscribing! Are you a minimalist? Do you travel light? We do! In our evening bag, you’ll find our multitasking faves! An under Eye Serum that multitasks as a facial moisturizer. 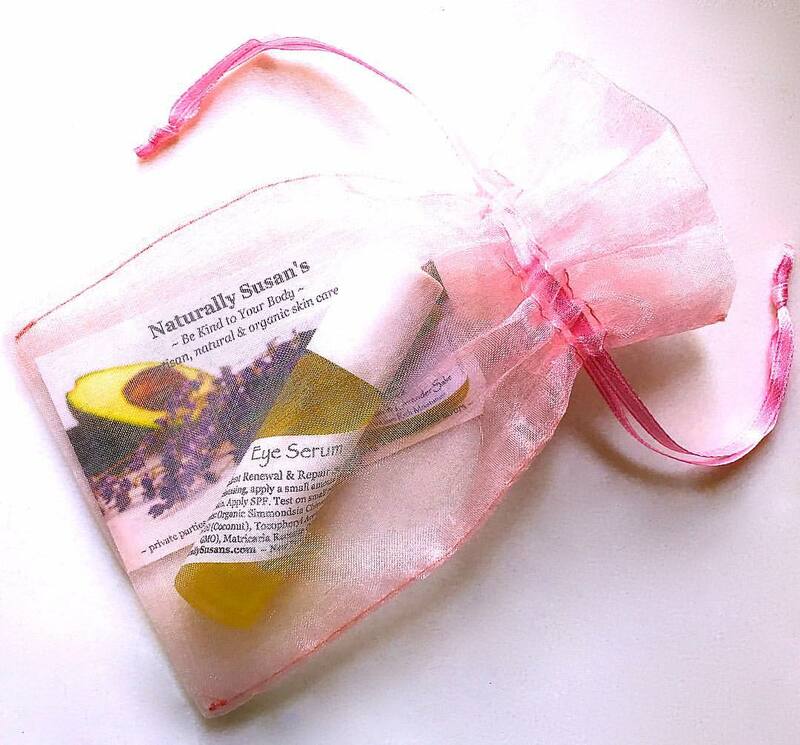 A Roll On moisturizer that multitasks as an all-natural perfume and aromatherapy. And, an All-Natural Hand Sanitizer that multitasks as a deodorant, room fresher, and surface cleaner. Let’s lighten your daily load with one of our newest package sets! Open to US residents only. No purchase necessary. One winner will be selected at random at the end of the entry period. Winner will be contacted by email. If a potential winner cannot be contacted, or if a selected winner cannot accept or receive the prize for any reason, the prize will be forfeited and awarded to an alternate winner. No substitutions are permitted. Prize may not be exchanged and may not redeemed for cash. Limit one entry per email address.